Fuyufuji 15K. [33 lb. ]Floating Large Pellet Only New formula. All weather/probioticsUltra Balance Replacement brand for the old Medicarp. Health/color formula. Replacement brand for the old Medicarp. Health/color formula. Premium food is original from Japan. The prescription is a mix of natural integrants for healthy fish. 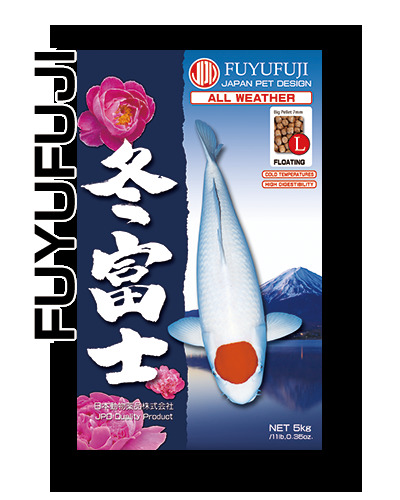 Best qua lYamato Nishiki Koi Food is an economically priced very high grade koi food, which representes excellent value for money. Yamato Nishiki Koi food is manufactured in Japan by one of the leading Koi Food manufacturers who also manufacture two of the worlds leading Koi Foods, Medicarp and Nobori. Yamato Nishiki Koi Food is a high quality growth Koi Food that cannot be matched by any other Koi Food on the market in this price range, Not only do you get a very good quality growth Koi Food but Yamato Nishiki Koi Food also contains Astaxanthin, which is a colour enhancer normally found in more expensive food.ity meals guarantee a high digestibility and taste. The food is made without synthetic colours and reduce muddy water. Enriched with Hemathococcus, phyto-plankton for colour enhances.